Mobile Crunch says they’ve got the scoop on Nokia’s next MID, the follow up to the N810. Called the Nokia N900 (it might also be called the “Rover”, or “Maemo Flagship”), it sports an overall smaller form factor but the same 3.5-inch touchscreen found in the N810 with a higher resolution of 800×480. Under the hood is an OMAP3430 500/600 Mhz processor and much like many of today’s handheld devices it includes an accelerometer and aGPS. What really separates the N900 from the N810 is that this is in fact a full blown smartphone with GSM Quad-Band and WCDMA connectivity. Although their leaked documents don’t explicitly read T-Mobile they believe that the instances of “TMO” reffer to the carrier and if true mean an international launch date of July and the US following in August or September and the EU in October. Other specs for the handset include the Maemo 5 OS, 32GB of internal storage, Firefox browser, video capture, back ground processes (run multiple programs at once), WiFi, HSPA, Flash compatibility and more. 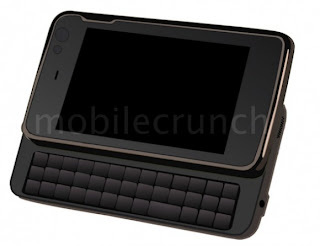 Although it’s not unlikely that Nokia will release a new iteration of the N800 device, I have a hard time believing that it would arrive this soon and still include a QWERTY keyboard. Of note, the above image is a rendered image from the leaked images - Mobile Crunch didn’t wanna burn their source by releasing what might have been watermarked pictures.